I truly believe that if Beethoven and Bach were alive today they would definitely be fans of SYMPHONY X and wished to become members themselves. I think it was 8 years ago when I first heard “The Odyssey”. Since then a new world of music was opened to me. I could not believe how good a mix of heavy music with double-bass drumming and dropped guitars sounded with the mix of Classical music. 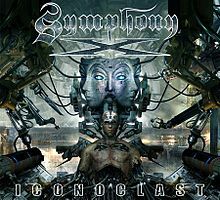 Since then I have been following SYMPHONY X and I have to say that this is one of the bands that never disappointed me. They may have changed and refreshed their style now and then but the main lines and spirit were kept always in front and that is making great symphonic progressive music. “Iconoclast”, their new studio effort is no exception. From the opening track that proudly carried the name of the album, SYMPHONY X will take you to a trip of complex arrangements, odd time signatures and top of the line compositions while holding on to the powerful and melodic choruses that made them so famous. Of course, lest you forget the great vocal performance of Mr. Russell Allen at the front and nothing would go wrong. The album was released four years after the last “Paradise Lost”, an album that was very mixed and a bit different than what was regularly from this band such as no long epics, a more aggressive vocal style and less keyboard work. On this album, the guys went a little back to the roots while still keeping their more aggressive style. I could definitely hear more keyboard work and what a great work Michael Pinnella did. The guitar work of Michael Romeo is usually amazing, and I truly think he is one of the greatest composers of our era. Also, let's not forget the rhythm section - Rullo and Lepond have once again left me speechless as they showed how tricky but yet smooth can a complex rhythm sound. In conclusion, this is my first nomination for the album of the year. Production wise, I liked what was done here. Even though there were some long epic moments, I was too into the music to notice that it was over. I just wanted to hear it again and again just to hear if I missed something. This album is definitely a must for every Progressive Rock / Metal and music fans everywhere!